For Arcam fans, the company is up there with Church's shoes or Aston Martin, genuinely English with a solid reputation. And whereas it may once have been seen as a little staid, these days it's rocking a lineup of AV hardware that will get any cinephile's juices flowing. the average seven-channel AV receiver. But it seriously punched above its weight, combining Arcam's Class G power amps with premium Dirac Live EQ. Now getting into the ring is the company's new AV860. This is a processor only. You will need power amplifiers to accompany it. With support for DTS:X and Dolby Atmos at 7.1.4, again aided by Dirac Live EQ, plus 4K/HDR passthrough over HDMI, it can be considered cutting-edge. The pre-amp/processor market is slightly crowded, with models from Marantz and Yamaha at the (relatively) affordable end and pricier options from Datasat and Trinnov. The AV860 appears well equipped to enter the fray. (My reference is the professional-grade Dolby CP850. I have heard of a few high-end home cinemas putting that unit in, even though because it's Dolby it does not support DTS...). Out of the box and viewed from the front, it could pass as the AVR850, as it looks identical apart from a little badge in the lower-left corner that whispers the model number. It's not until you look around the back do you see the difference – a dozen XLR sockets for audio output. XLRs have become fashionable on home cinema gear as they give the impression that it's a professional-level product. Yet like its competitors, the internal architecture of the AV860 is unbalanced, so these sockets are converting unbalanced to balanced – some of the truly great advantages of XLR are lost. The output level is also consumer standard, not the higher output of professional gear. This is not a problem, just an observation, as all other consumer AV processors have this issue. Also on the back are the usual connection suspects. Nothing is missing here, beyond an AES/EBU input but that has no place in home cinema as HDMI is king. Of the latter, there are seven inputs and three outputs – two for your main zone (for a TV and projector) and one for Zone 2. Then there are four 12V triggers (two for each zone), RS232, a 6V output via minijack, coaxial and optical digital audio inputs, a USB socket, and a forest of stereo analogue ins. A pair of XLR inputs, for high-quality two-channel devices, might have been nice. The unit offers Ethernet but no Wi-Fi. Personally, I see the logic in this as Wi-Fi in a premium audio product, regardless of how well it's shielded, will impact audio fidelity. A DAB/FM tuner is built-in. After complaining about wildly different DAB levels when listening on the AVR850, Arcam has added a DAB level trim control which proves very useful if, like me, you tend to roam the dial a lot. The AV860 is essentially the AVR850 minus the internal power amplifiers, but with the addition of a high-quality XLR analogue output. This is reflected in the price; it's £500 cheaper as it doesn't have seven channels of grunt under the hood. 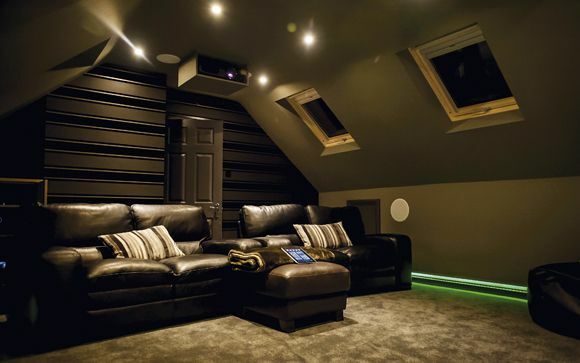 Yet it's a better avenue for those with serious home cinema ambitions. One issue with the AVR850 was that for Atmos above 5.1.2, you had to employ additional power amps anyway. Nor was its 7 x 100W into 8 Ohm power claim necessarily the sort to be welcomed in super-large cinema rooms. Video trickery is absent. The AV860 works as a switcher but nothing else. Again, this isn't an issue. More of a niggle is the user interface design. The setup menus are essentially identical to the AVR850's, which means they still look old-fashioned. But after initial setup you'll probably not spend much time with them. Network connectivity enables the Arcam to be integrated with whole-house control systems, or with Arcam's iOS MusicLife UPnP/control app, which is easy to use and responsive. This can connect to UPnP audio servers to play your collection of FLAC, MP3, WAV, WMA and AAC tunes. There's DSD support, nor Apple AirPlay, which will put off some buyers. It is Spotify Connect enabled, however. I kicked off my listening with the 7.1 DTS-HD Master Audio mix on the Rogue One Blu-ray. As Orson Krennic's ship approaches and lands on the surface of Lah'mu, the Arcam presents a wonderful appreciation of sound steerage, panning the audio effortlessly. The mix sounds clear, loud and very crisp with a rich, deep bass. I did a side-by-side comparison of the AVR850 via its phono outputs and the AV860 via XLR (using Constellation Audio power amps and Wilson Audio speakers). What was immediately apparent was how superior the AV860 was. It had a depth and clarity that surpassed the receiver. The experience was similar switching to the AV860's phono outputs. You really will want to partner this with XLR hardware. Moving on to Dolby Atmos material meant I decided to switch player (to a 4K model), which thankfully didn't cause the Arcam to stumble over any HDCP 2.2 handshake issues. Mel Gibson's WW2 drama Hacksaw Ridge (Ultra HD Blu-ray) won an Oscar for its soundmixing, overseen by legend Kevin O'Connell who – despite being nominated 20 times – had never won before. It's a thrilling Atmos track. I spun through to the assault on the cliffs, which begins with Navy artillery fire, building slowly to the engagement where the sound kicks like a deranged mule. Some Atmos tracks seem shy of using the extra channels – this film isn't. Via the AV860, it brought up memories of Saving Private Ryan. I felt like I was trapped in the centre of the action. Compared to any other processor I've heard (expect the aforementioned Dolby 850), this sounded clearly bigger and more powerfully presented. The weight and positioning of effects is exemplary, making the onscreen action seem almost too close for comfort. This was all with the AV860 running the Dirac Live EQ, of which I am a huge fan. It's the crème de la crème of consumer EQ suites, although not designed for the casual, time-poor user. I covered it before with the AVR850, but I'll briefly explain again how it works. All this data is then analysed and a correction curve arrived at to allow the AV860 to fine-tune your speaker's performance, based upon the unique characteristics of your listening environment. Bespoke target curves can be set; I go for Dolby's X Curve. Tuning includes subwoofers, too, which is particularly useful as these are often the hardest things to get sounding good. Anyway, for a change of pace from sci-fi and warfare, I queued up La La Land (Ultra HD Blu-ray). I wasn't particularly looking forward to it as I hated the film when I first saw it, but this disc has an Atmos mix, too. The performance of the AV860 with the opening dance number actually made me want to watch it all. Scary. It had rhythm and timing in abundance, and also showed up how bad the lip syncing is in the freeway sequence. That same sense of timing and precision, of unimpeded resolution, makes it a good choice for hi-fi fans. A recording of Tchaikovsky's Piano Concerto No.1 by the London Symphony Orchestra (SHM-SACD), fit the Arcam's delivery like a silk glove. While the AVR850 gained DTS:X decoding support via a firmware update, it's present on the AV860 out of the box. Next off the pile, then, was the Ultra HD Blu-ray of Patriots Day – you can't knock a Mark Wahlberg/director Peter Berg combo. As with Hacksaw Ridge, it's not a happy story, and sound plays a major part in the drama. There's realism to the spatial accuracy of sound effects, with the 3D audio yet again putting you front and centre of the action, be it the layered crowd scenes or quieter, less busy moments. It was never too loud or too quiet; the AV860 with Dirac was giving a masterful, assured performance worthy of any high-end screening room. And that's the thing. You would never run the AV860 with Dirac disabled. Do that, and your speakers, subwoofer(s) and room acoustics are being left to their own devices, and the sound will shrink down and become muddied as a result. But Dirac isn't exactly a plug-n-play EQ system, meaning this Arcam isn't for the faint-hearted. It's designed to be the sonic heart of a high-end setup, and could take a day if not more to get it running correctly. Like any high-end instrument, it's only as good as the fine-tuning. There are niggles here, as there were with the AVR850. The user interface is uninspiring, the lack of AirPlay and DSD surprising, and the headphone output remains 3.5mm. But if you want a 3D sound preamp/processor and you want the best with available software (the absence of Auro-3D isn't really a concern), this is it. The other problem is that you need partnering hardware, and you'll soon run up a bill. Want to run 11 channels? Then you need 11 channels of juice. Stay in house with Arcam’s Class G power amp range (including the £1,600 P429 four-channel model chiefly designed to add that extra quartet of speakers to a seven-channel AVR) and your bank manager will start noticing. And then there's the speakers to consider. But that's what the AV860 is all about. I have no problem in recommending this as the cornerstone of a system above the £20,000 mark. In fact, it wouldn't be out of place in a setup costing ten times as much. We say: A reference-level preamp/processor that sounds sublime, but you need to invest time (or maybe pay someone else) to get it set up correctly.